While certain, industry-standard preventative maintenance procedures exist, the real work keeping power generation equipment running as intended over the long term involves working with customers to make sure the real-life conditions of their assets are taken into account. Ambient conditions, workload, frequency of use and an array of other factors will determine where our experts focus their attention when crafting your preventative power generation maintenance program. A generator powering equipment at a construction site, for instance, will have different maintenance requirements then one that’s used only in the event of a main system’s failure. Neither is necessarily more important than the other, but they need to be cared for in different ways. That’s why it’s important that a preventative maintenance program is designed by experienced professionals. Through a combination of inspections and services, CK Power’s certified staff designs and executed preventative maintenance programs for the commercial, residential and marine sectors. Transfer switches are the mechanisms responsible for ensuring a continuous power source to a facility by automatically activating the emergency generator in the event a main power source falls below a predetermined voltage threshold. In other words, even the best generator money can buy is worthless without a fully functional transfer switch. That’s why transfer switch maintenance is so essential in industries where a continuous power source is critical. In fact, regulations like National Fire Protection Association (NFPA) code 110 mandate that transfer switch preventative maintenance occurs at least annually. CK Power is the only preventive maintenance company that offers comprehensive transfer switch PM’s and TOTAL transfer switch service, repairs, and replacement. 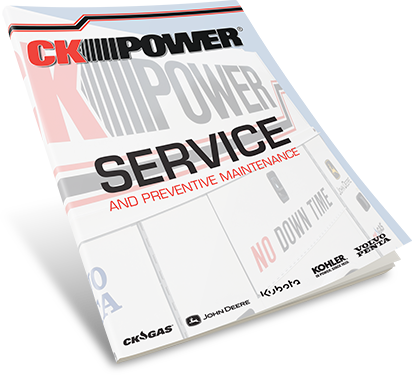 Like any aspect of CK Power’s power generation maintenance programs, preventative maintenance programs can be specifically tailored to your scheduling needs. They are available annually, semi-annually, quarterly or monthly and on an emergency basis. No matter the manufacturer, where it was purchased or what shape it’s in, we’re ready to talk power generation maintenance. Download our guide through the link below for more on the specifics of the programs and services we offer, then contact CK Power’s maintenance department to get started crafting a plan that’s right for you.